From a declining industrial center, Glasgow has been transformed into a forward-looking city and one of the hippest spots in Europe. Architectural styles abound, as well as a burgeoning cultural sector, while some of Scotland’s most beautiful mountains, glens, and lochs are easily accessible. 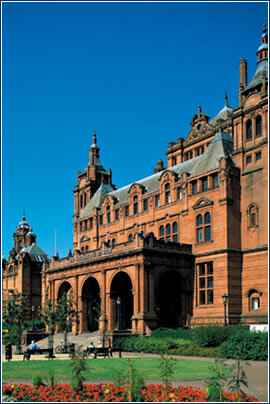 Favorite attraction: AArchitecture – Kelvingrove Art Gallery & Glasgow University in West End. Internet site offering excellent deals on dining throughout the city. 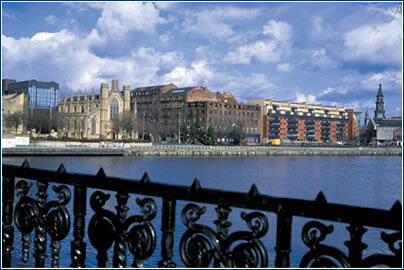 Advice: Merchant City area in general offers a large array of shops, restaurants, bars and clubs. It’s a popular residential area in the city center for professionals and students. The tower at the center, it has a fantastic view over the entire city. It has everything you could want! Advice: Try to stay in a central hotel, as getting a taxi after a late night out is impossible. Favorite attraction: Celtic Connection – The biggest winter festival of Scottish music in the world, taking place in Glasgow every year in late January and early February. Right after London, Glasgow is the best place for shopping. Advice: Glasgow has the best clubs and night life in Scotland, so don’t hesitate to enjoy yourself. www.cityguide.travel-guides.com/cities/gla/BusinessServices.asp – prime contacts /links for anyone seeking to do business in Glasgow. www.scottishlaw.org.uk/scotlaw/usecitiesglasgow.html – a good overview of things to do and see in and around the city. www.lonelyplanet.com/destinations/europe/glasgow/ – the folks at Lonely Planet turn their eyes to “the most Scottish of cities”. 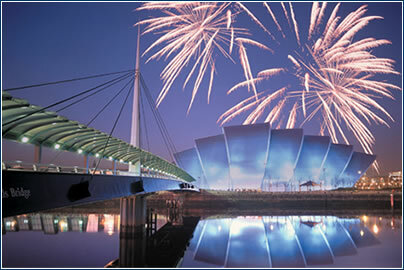 www.glasgowguide.co.uk/info.html – a portal page for links to Glasgow, as well as a discussion board. www.virgintrains.co.uk/destinations/glasgow/overview.aspx – a stylish site on travel tips to and within Glasgow, run by Virgin Train lines. · The business atmosphere is a little more relaxed than in cities such as London, although normal standards of business attire apply and punctuality is important. Most companies operate during standard business hours of Monday-Friday 0900-1700. · Clients are usually well entertained by their Glasgow hosts, most likely taken to lunch in a restaurant or pub – depending on the formality of the business meeting – or to a restaurant in the evening. It is not usual for clients to be invited to one’s home. · One of the engines of the industrial revolution, Glasgow is today spearheading developments in the IT and service sectors. Currently, 84% of the city’s working population is employed in service activities, with 9% in the manufacturing sector (nearly half of which is in engineering) and 7% in construction. · Glasgow is generally recognized as the Britain’s call-center capital and is developing an ever stronger profile in areas of high technology, accounting services, and technology-based financial operations. It has one of the most advanced fibre-optic telecommunications networks in Europe and ISDN connections are readily available. 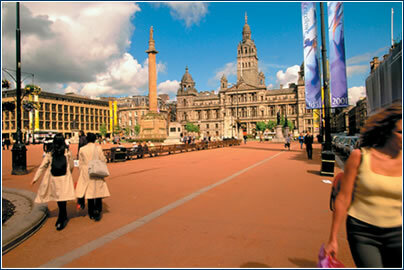 Glasgow is also the commercial, retail, leisure and educational hub for half of Scotland’s population. The workforce is increasingly multi-lingual and includes a high number of university graduates.